"Liberalism: a Primer" author Dr. July Teehankee and Rep. Neric Acosta heads the book launch. 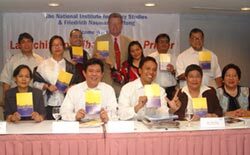 The National Institute for Policy Studies (NIPS) and the Friedrich Naumann Foundation (FNF) unveiled Liberalism: A Primer, a compilation of the basic tenets of liberalism on April 12, 2005 at Quezon City. The 24-page book was authored by Prof. Dr. July Teehankee, the newly elected managing trustee of the Philippine liberal think tank. The booklet summarizes two years of debates among leading exponents of the Liberal Party. NIPS intends to use the primer in all its training seminars and distribute it to members of the Liberal Party (LP), government officials, organizations, corporations and also public libraries. “This book is a first step towards transforming the political culture in this country towards platform based political parties,” said Congressman Dr. Nereus Acosta, the chairman of NIPS. In his congratulatory message, Dr. Ronald Meinardus, FNF Resident Representative, called the launching of the book a “cause for celebration”. He added that the publication is timely as it coincides with many political debates in the liberal camp. “One crucial condition for programmatic work and discussions in a political party is the knowledge of the common ideological roots, this is where the primer comes in”, Dr. Meinardus said. The launching event was attended by well over one hundred members and friends of the Liberal Party, among them governors, members of Congress, allied organizations and the media. Following a recommendation by LP President Senator Franklin Drilon, NIPS and FNF are jointly working on the translations of the primer into Filipino and Cebuano.